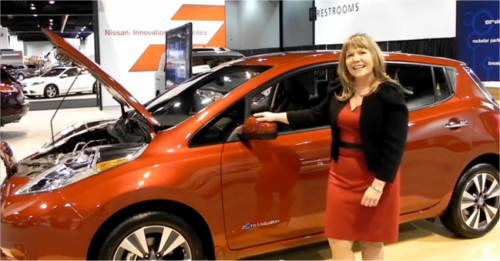 An interview with Lisa Farrar, Senior Planner EV Marketing and Sales Strategy at Nissan, about the 2013 LEAF and its features. Nissan is highlighting the 2013 LEAF at the Denver Auto Show and emphasizing that it's now made in America. At the 2013 Denver Auto Show in Colorado, Nissan is highlighting the 2013 LEAF, which has become a hot seller in the Denver-Boulder area. We talked to Lisa Farrar of Nissan about the new LEAF and its features, including the fact that it's now built in the company's Smyrna, Tennessee plant. Details on the new LEAF were released in early January and covered by David Herron here at Torque News. Incidentally, the batteries are also made in Smyrna at the nation's largest lithium-ion automotive battery plant. In our video below, Lisa walks us through some of the key improvements made to the 2013 LEAF. These include improved aerodynamics, better regenerative braking, and a new 6.6 kW onboard charger that reduces charging time by almost half, cutting it to about four hours for a full charge. Lisa also highlights the new S trim level which gives a base model that can be well under $22,000 after incentives. The new EPA testing procedure for MPGe gives the 2013 NIssan LEAF a range of 75 miles per charge in mixed driving. During the presentation for the LEAF to the press at the Denver Auto Show, it was shown that the average LEAF driver in the U.S. drive about 31 miles per day in their electric car. The number one request from customers for the new model year as the addition of the charge port light and lock as well as the addition of a charge port door release button to the keyfob to make plugging in easier and more secure. Nissan also improved the interior heating system by making heated steering and driver's seating standard and with a new, low-energy heating unit for the cabin air heating. These improve range in colder weather by reducing the amount of battery energy used to keep the interior warm for its occupants. Another key interior improvement was moving the onboard charger to one side so that the cargo area and folded seats provide a flat space to give a full 30 cubic feet of cargo space that is entirely usable.